Vatsalya Trust Mumbai is a non-profit organization that was established in 1983, with the primary objective of caring for and rehabilitating destitute children through its orphanage as well as other social programs. The name ‘Vatsalya’, a Sanskrit word meaning affection, was considered appropriate for naming the Trust, as it works for the welfare of children/young adults and provides various facilities for their social and economic upliftment. Over the years, the Trust’s focus areas have extended beyond just the caring of destitute children/young adults, to include women’s empowerment and education efforts. 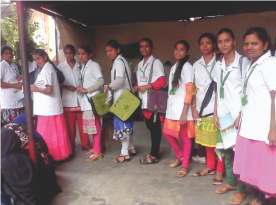 IDRF has been funding Vatsalya Trust’s Patient Assistant Program, which began in 2005, in order to create skill development among girls from rural Maharashtra. Under the guidance of qualified nurses and doctors, well over 700 economically disadvantaged women have gained quality technical education in the medical field. A unique feature of this program is to focus on the participation of girls from tribal areas. Each batch of students has included around 10-12 tribal participants who receive free lodging, boarding, medical facilities, and tuition. After four months of the theoretical training, the participants are sent to reputed hospitals for a period of six months to get practical training. Almost all the participants have been able to get employment in various hospitals, clinics, and nursing homes after the completion of the courses. The growing demand of trained patient assistants in the society, especially for looking after of aged parents of working adult children, has encouraged girls from underprivileged sections of the state to attend this program, get employed and become self-reliant. Please click on the following link to learn more about Vatsalya Trust’s programs for destitute children and women.